Well, it’s not exactly spring over here in Europe, but down under in Australia it is … so time do some spring cleaning. At a model railway convention I found one of these small Decauville locos made by Jouef. It did not cost that much as the cab had broken off, but it did not run that well either. Fortunately I remembered reading an article by François Fontana, where het took one of these buggers apart and gave it a good rinsing. It was published in Voie Libre, the well known French narrow gauge railway modelling magazine, which now is available as a digital version in English via Zinio.com and can be read on your iPad or Android tablet … tried it yesterday on mine and it works great! OK, enough said about tablets … back to work again. 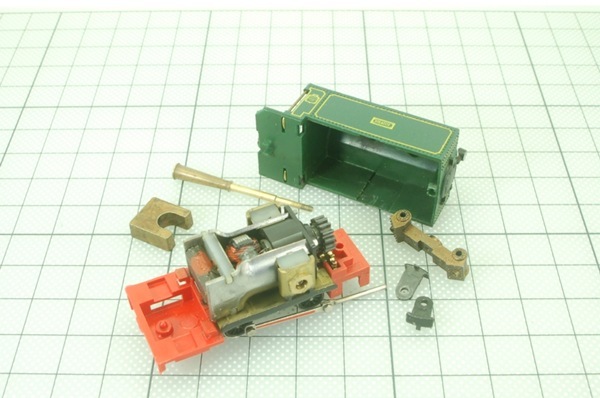 You start out by dismantling the locomotive, which is quite easy. 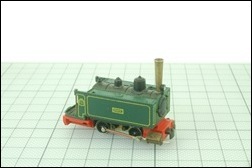 Just unscrew the smoke stack, push the body backward a bit and lift it off. Then take out the small weight beneath the cab, remove the couplers and the cylinder block. The driving rods can be removed from the wheels with a couple of fine tipped pliers. Now come that harder stuff … taking apart the mechanism in such a way, that it will be possible to put it back together again. You first have to remove the motor. Pick up your pliers or a small spanner and unscrew the two carbon brush holders at the side … be careful with the carbon brushes and springs! 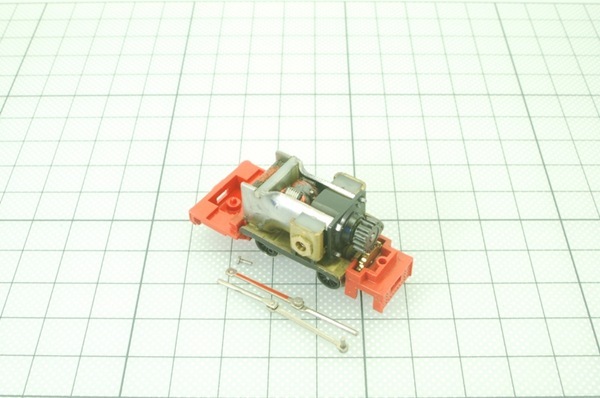 Once the holders have been removed, you can just take out the motor itself. The motor can be cleaned with a small dry brush, to remove the dust. I also tend to use a rubber blower, which is used to clean a camera, for these kind of jobs. If there is much grease on the cog of the motor, clean it with a brush and a bit of alcohol. Once all is clean, screw the carbon brush holder back in the motor, connect them to a transformer give the motor a good run. Now back to the last part, the frame. Locate the two small nuts between the wheels and unscrew them with your pliers and remove the bolts from the other side … be careful not to lose the insulating washers! Next remove the wheels from one side. 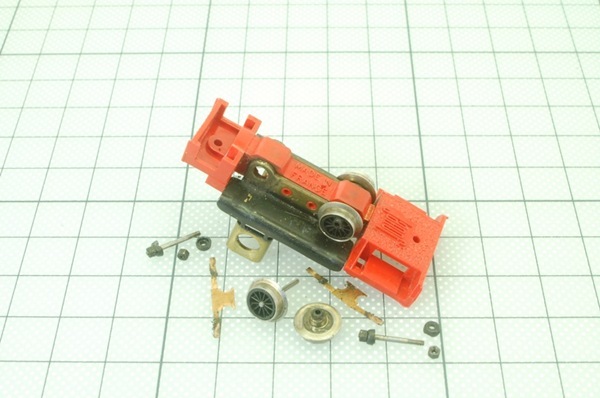 Gently pry them lose by pushing a small screwdriver between the wheels and the frame. The centre of the wheel is made of plastic, so they come off quite easily. Once they are off, carefully remove the axles by sliding them through the cogs. 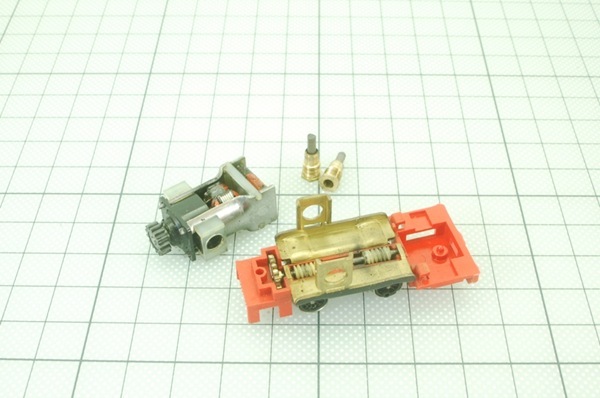 This last action releases the brass pieces on the side, the drive shaft with its worm gears and the two small cogs. Once everything has ben taken apart, the parts are soaked in white-spirit and one-by-one cleaned with a soft brush. 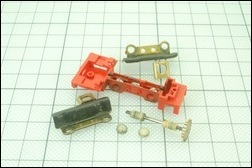 The fully cleaned parts are dried with a tissue and the mechanism is put back together again. 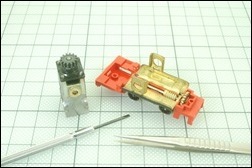 The worm gears on the drive shaft are lightly oiled, before the motor is placed in its position. It’s a fun little project which can be done with a couple of simple tools and it will only cost a couple of hours to complete. The advantage is that you will have a nice and smoothly running mechanism again, which can be used for a any new HOn30 project. François Fontana even built a Bayer-Garrat with two of these! This entry was posted in Rolling Stock by Koala Creek. Bookmark the permalink.